Let me tell you about this book! What started off slow and rocky ended with a bang! (That is why I always give a book at least 40 pages.) Rory (Aurora) is a 20-something college graduate finding her way in the world when she bumps into Houston, her deceased best friend's brother and ex-boyfriend from five years ago. Now, married and running his own micro-brewery he attempts to reconnect with Rory. As their relationship develops, the darkness in their pasts unfold and we realize the two of them left a lot unsaid. As Houston's marriage deteriorates, the two begin to fall back into familiar patterns. The characters in this book are not your typical clear conscious hero's. In fact, they shamelessly display some of most frightening and horrific sides of human nature and it is delicious! Who wants their heroine to have self-respect and a clear sense of right and wrong? Not me! The characters are interesting and volatile and will entrap my imagination for days to come. I give the author a standing ovation for the bravery and talent it took to write character's who are relatable, morally corupt, a little psychologically unstable and still leave the reader wanting more. Please, just let me tell you the ending to this book is AMAZING! I don't know what this statement will say about me, but when you read books involving a romantic reconnection, you do not expect this ending! This is why I loved it! 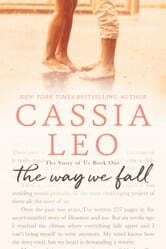 Cassia Leo has gotten my attention in the world of emerging authors and I hope I've gotten yours to read this book! Overall it was a good story, but it was difficult to follow, it jumped back and forth between past and present and character to character. Thought it was cool at first, but it's just an uncompleted story. I hate it. Wish it was complete. Y can't u guys just complete a story. U just made me loose interest in the other part. What is a story if it's not complete. This is no suspense, it's a story killer. U want to make more money by making it into two parts, OK, but u also loose ur readers. Enjoy. I absoutely adored it! The storyline so capivating, moving and reminiscent of everyone's first 'true' love. Thanks Cassia for reminding us all of the honest, heartfelt and overhelming emotions of the first time 'we fall'.